Some might remember reading this past May about an extraordinary tree on the farm here in Tokyo. 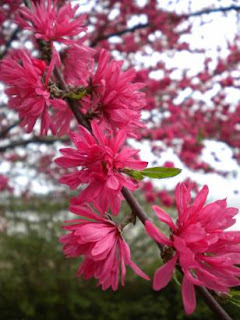 A bright bloomer, the ornamental peach or himomo, stopped people in their tracks as they went about daily errands. Women in kimono stopped to have their photo taken under it's branches while standing on ground sparkling with pink petals. The blossoms attracted bees galore and birds fluttered about its top regions busily chatting about the season's work ahead while we passed to and fro with seedlings and produce below. The thick and brilliant green leaves provided deep shade for the table and tent where tomatoes, green beans, eggplant, and edamame turned into little bundles to be sold at the farm stand or the local supermarket. Typhoon Roke, though, brought the beloved himomo down on Wednesday. High winds proved too much for this old friend, and she now lies stricken in front of the gate. Given our lack of space and her prone position across one of the main access points for the farm and fields, she'll have to be taken away. Sun and cloud, wind and rain, life and death are all part and parcel of farming, but there are times when it isn't easy to accept. It goes without saying that our hearts are breaking. 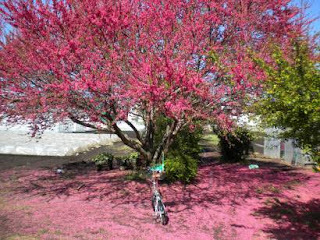 What a beautiful tree that brought pleasure to so many. I mourn this tree's passing, too. Beautiful post about a dear friend taken too early. Thanks for sharing. Oh what a moving tribute!! I'm sorry for the loss of this marvelous tree- your words were so beautiful as you described the beauty and the joy the tree brought to so many- it is a very sad loss. Thanks all for your kind words. It's hard to see the stump these days, and people are stopping by to ask what happened. It's nice to see and hear how much the tree meant to others in the community, too.